WHITE SMOKE - Habemus Papam - We have a Pope! The current week's homily is available on a link on the front page of the website next to the link for the current week's bulletin. On the page with the prior bulletins, the corresponding homily will be sitting side by side with its bulletin. We started on the anniversary of the start of the Catholic Church, Pentecost Sunday --- nearly four years ago. This week, Easter, is our two hundred and fifty sixth! podcast to be posted. The homily is given by Deacon Dwayne Joubert. The current week's homily is available on a link on the front page of the website next to the link for the current week's bulletin. On the page with the prior bulletins, the corresponding homily will be sitting side by side with its bulletin. 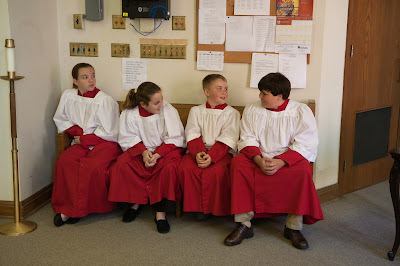 We started on the anniversary of the start of the Catholic Church, Pentecost Sunday --- nearly four years ago. 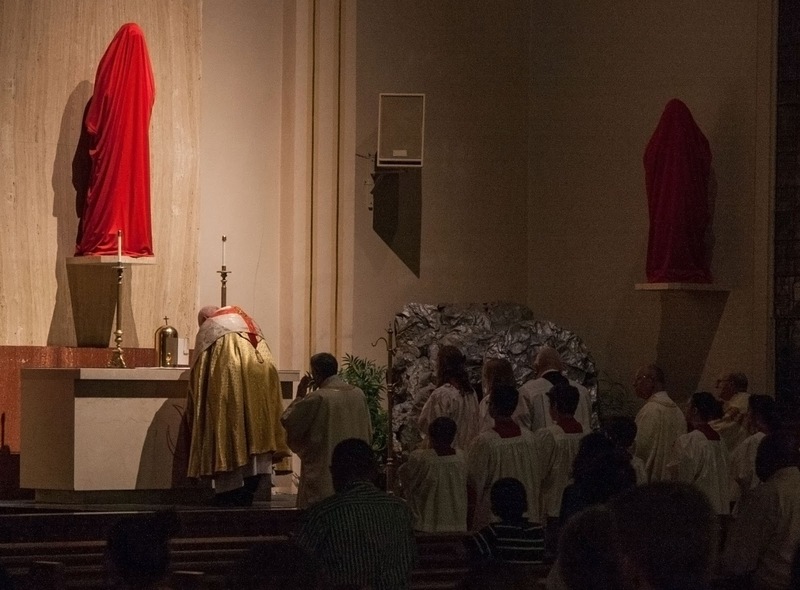 This week, the Easter Vigil, is our two hundred and fifty fifth! podcast to be posted. The homily is given by Deacon Sammy Diesi. 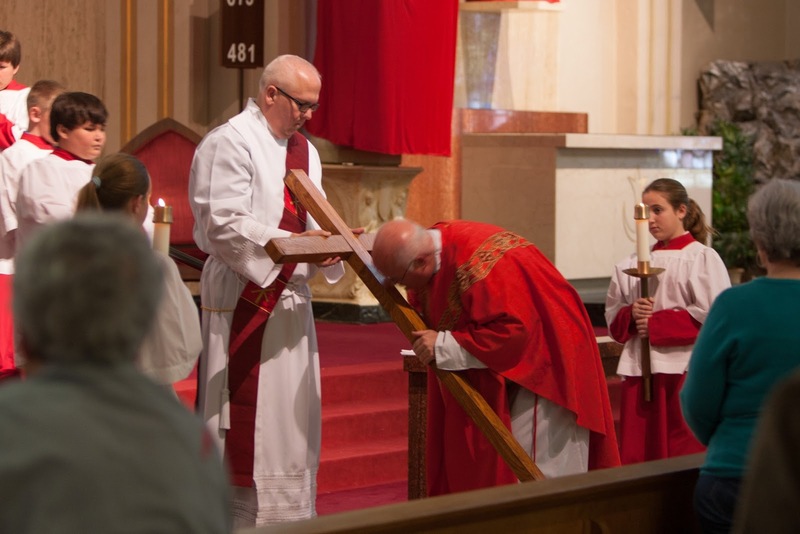 Here are some photos from the Good Friday Service at St. Landry Catholic Church. Click here to see them on Flickr. The current week's homily is available on a link on the front page of the website next to the link for the current week's bulletin. On the page with the prior bulletins, the corresponding homily will be sitting side by side with its bulletin. We started on the anniversary of the start of the Catholic Church, Pentecost Sunday --- nearly four years ago. This week, Good Friday, is our two hundred and fifty fourth! podcast to be posted. The homily is given by Father James Brady. 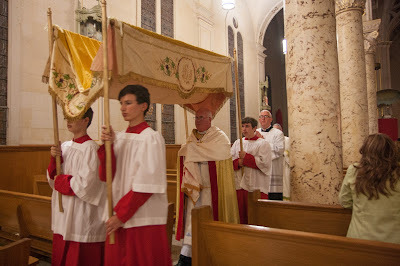 Photographs from the Mass of the Lord's Supper from St. Landry Catholic Church are now posted to our Flickr page. As a little treat from last night's Mass of the Lord's Supper ... recordings of the Pange Lingua from two different parts of the mass. 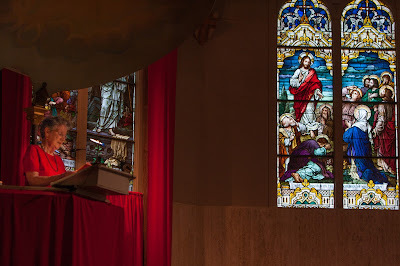 The current week's homily is available on a link on the front page of the website next to the link for the current week's bulletin. On the page with the prior bulletins, the corresponding homily will be sitting side by side with its bulletin. We started on the anniversary of the start of the Catholic Church, Pentecost Sunday --- nearly four years ago. This week, the Passion Sunday is our two hundred and fifty first! podcast to be posted. The homily is given by Father James Brady. 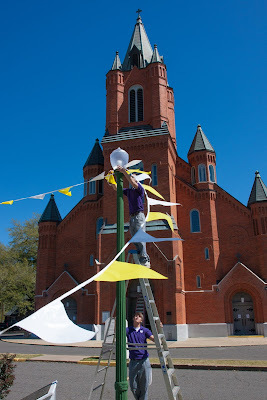 In celebrating the election of our new Holy Father, Pope Francis, members of the confirmation class helped put out pennants in papal yellow and white around the church building, Valentin Hall, and the church grounds. Deacon Dwayne Joubert called the group together once the white smoke came up over the Sistine Chapel. Yvonne Normand brought yellow and white bunting and decorated as well. The bulletin for the week of March 31, 2013 has been posted. Click here to see it. This week, it includes the list of donations and intentions for Easter flowers as well as the Holy Week schedule. Homily for Passion Sunday - and our 250th podcast!!!! The current week's homily is available on a link on the front page of the website next to the link for the current week's bulletin. On the page with the prior bulletins, the corresponding homily will be sitting side by side with its bulletin. We started on the anniversary of the start of the Catholic Church, Pentecost Sunday --- nearly four years ago. This week, the Passion Sunday is our two hundred and fiftieth! podcast to be posted. The homily is given by Father James Brady. Our Lady of the Oaks Retreat House is offering a silent retreat for the women of the Opelousas area on May 9-11. 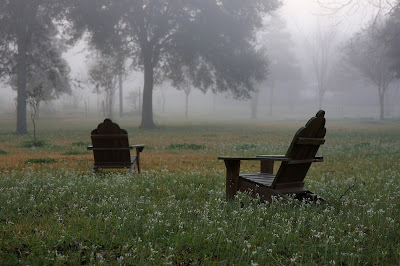 You will find time to relax, to reflect, and to pray. Please consider this retreat by calling Yvonne at 308-3474 or the retreat center at 662-5410. There is no fixed charge for the retreat. An anonymous donation is asked on the last day of the retreat. A $25 deposit is required at registration, which is part of your donation. 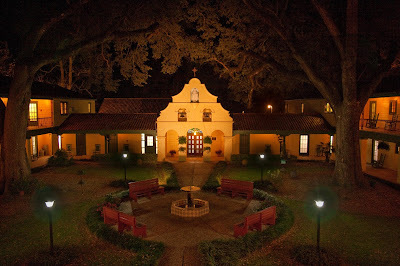 Our Lady of the Oaks is a Jesuit retreat house in Grand Coteau, built in 1938. It neighbors with St. Charles College, a Jesuit seminary and individual retreat center, St. Ignatius School, St. Charles Borromeo Catholic Church, and Sacred Heart Academy. 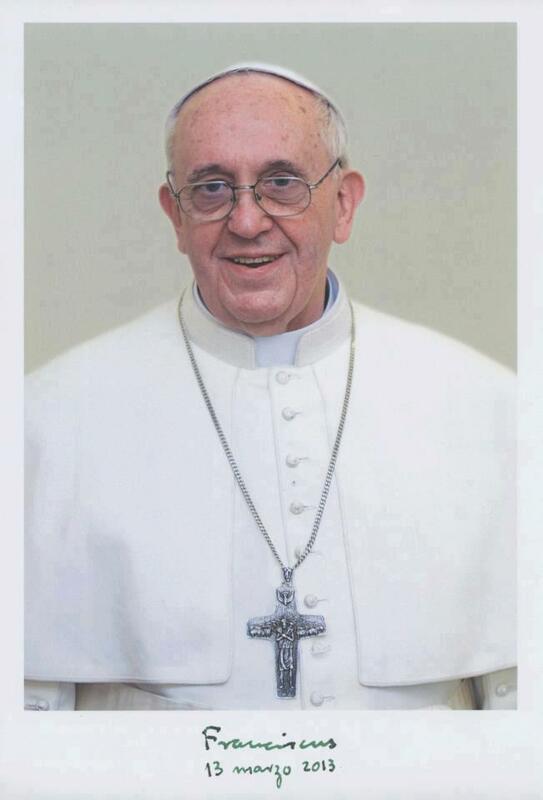 The Vatican has released the official photograph of the Holy Father, Pope Francis. This weekend, we celebrate Passion Sunday, or Palm Sunday. It marks the beginning of our remembrance this coming week of the events that give rise to our salvation. 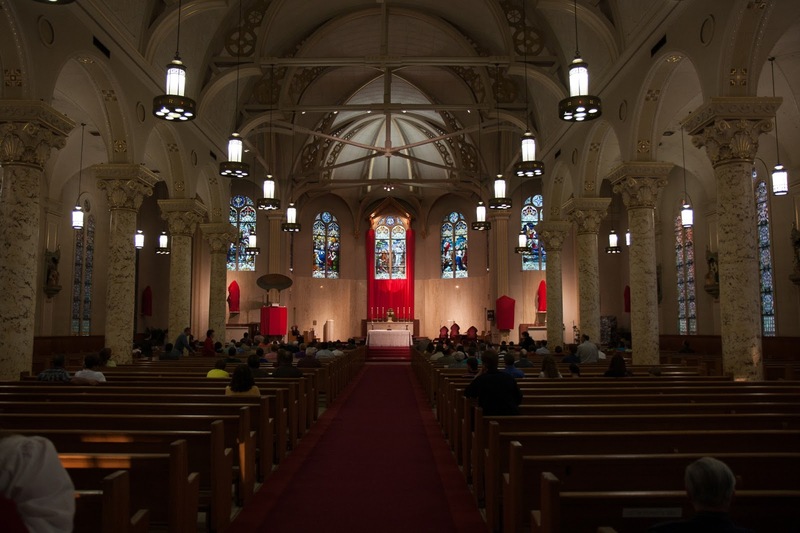 There are several special liturgies and other events this week. Please take a look at the insert in last week’s bulletin for our Holy Week schedule of liturgies and events ... or download it separately here. In the back of the church, we also have printed meditations for holy week entitled Walking with Jesus in Holy Week. Please download a copy here and meditate on these thoughts over the entire week starting on Palm Sunday. A special effort should be made by each of us to attend the major liturgies of the Easter Triduum, that is Holy Thursday Mass celebrating the institution of the Eucharist, Good Friday Services commemorating our Lord’s Passion, and the Easter Vigil. We are blessed that we will have five parishioners being baptized, received into the Church, or Confirmed at the Easter Vigil. These Liturgies are moving and beautiful, and are a fitting way to celebrate these most important events. Easter weekend often begins early in the secular world, with our children having off from school and many places of employment closing early for the holiday. This provides time for us to attend the Triduum Liturgies. A thought for reflection this week: If we can make time for other social events during the Easter Holiday, then should we not also be able to make time to attend the Easter Triduum Services? And if we cannot make the time, then do we need to examine our priorities? which we benefit so greatly! The bulletin for the week of March 24, 2013 has been posted. Click here to see it. Jesus saw him through the eyes of mercy and chose him Jesus saw a man called Matthew sitting at the tax office, and he said to him: Follow me. Jesus saw Matthew, not merely in the usual sense, but more significantly with his merciful understanding of men. He saw the tax collector and, because he saw him through the eyes of mercy and chose him, he said to him: Follow me. This following meant imitating the pattern of his life – not just walking after him. St. John tells us: Whoever says he abides in Christ ought to walk in the same way in which he walked. And he rose and followed him. There is no reason for surprise that the tax collector abandoned earthly wealth as soon as the Lord commanded him. Nor should one be amazed that neglecting his wealth, he joined a band of men whose leader had, on Matthew’s assessment, no riches at all. Our Lord summoned Matthew by speaking to him in words. By an invisible, interior impulse flooding his mind with the light of grace, he instructed him to walk in his footsteps. In this way Matthew could understand that Christ, who was summoning him away from earthly possessions, had incorruptible treasures of heaven in his gift. 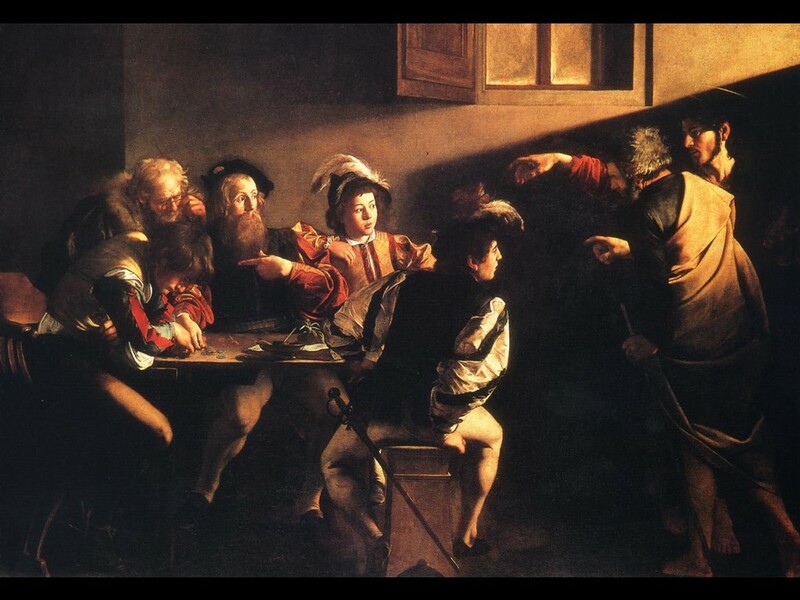 As he sat at table in the house, behold many tax collectors and sinners came and sat down with Jesus and his disciples. This conversion of one tax collector gave many men, those from his own profession and other sinners, an example of repentance and pardon. Notice also the happy and true anticipation of his future status as apostle and teacher of the nations. No sooner was he converted than Matthew drew after him a whole crowd of sinners along the same road to salvation. He took up his appointed duties while still taking his first steps in the faith, and from that hour he fulfilled his obligation and thus grew in merit. To see a deeper understanding of the great celebration Matthew held at his house, we must realize that he not only gave a banquet for the Lord at his earthly residence, but far more pleasing was the banquet set in his own heart which he provided through faith and love. Our Savior attests to this: Behold I stand at the door and knock; if anyone hears my voice and opens the door, I will come in to him and eat with him, and he with me. On hearing Christ’s voice, we open the door to receive him, as it were, when we freely assent to his promptings and when we give ourselves over to doing what must be done. Christ, since he dwells in the hearts of his chosen ones through the grace of his love, enters so that he might eat with us and we with him. He ever refreshes us by the light of his presence insofar as we progress in our devotion to and longing for the things of heaven. He himself is delighted by such a pleasing banquet. The current week's homily is available on a link on the front page of the website next to the link for the current week's bulletin. On the page with the prior bulletins, the corresponding homily will be sitting side by side with its bulletin. We started on the anniversary of the start of the Catholic Church, Pentecost Sunday --- over three years ago. This week, the Fifth Sunday of Lent is our two hundred and forty ninth! podcast to be posted. The homily is given by Father James Brady. As I mentioned last week in my homily, we have begun using a new expanded format for our bulletin. We began the process last Fall and the work has now come to fruition. We had several goals in mind in upgrading our bulletin. First, we simply needed more room for news about our parish and diocesan events of interest. Also, we wanted to make the bulletin easier to read as it had become so crowded that we had to use smaller print to make everything fit, but the print had become so small it was hard to read. Third, we wanted to make the bulletin easier to publish, as it was difficult to edit the bulletin because of antiquated software, and this made working with the bulletin difficult for both our staff and the printer. Finally, we also wanted to more prominently display the beauty of our church building by enlarging the image of the church as beautifully depicted in the “Pen and Ink” done by J.A. Allen. All of these goals have been met. We will continue to “tweak” the bulletin in the coming weeks and months, and our ability to do so has improved because of the changes. I want to thank all of those who have made this project a success, especially Kenneth Thibodeaux and the Knights of Columbus (who sponsor the bulletin and sell the advertising), Priscilla Guidroz and Dee Boudreaux (who worked on the transition and edited the new layout and design), and Andrew Guidroz (who coordinated the change in software) and Bodemuller’s Printing (coordinated the printing of the bulletin with the new software). I also want to thank our sponsors who advertise in the bulletin. Without you, the bulletin would not be possible, and I hope that all of us keep them in mind when purchasing goods and services. Congratulations on a job well done! The bulletin for the week of March 17, 2013 has been posted. Click here to see it. 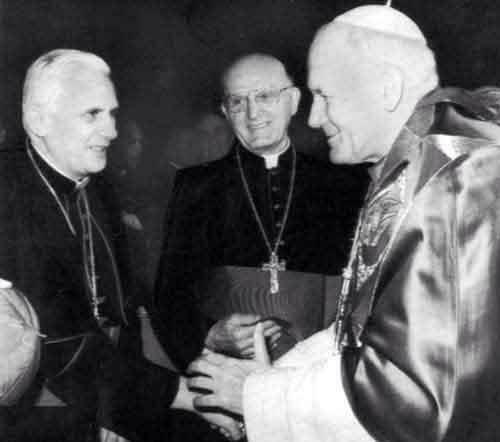 The man in the middle is Cardinal Luigi Dadaglio, not the current Pope. 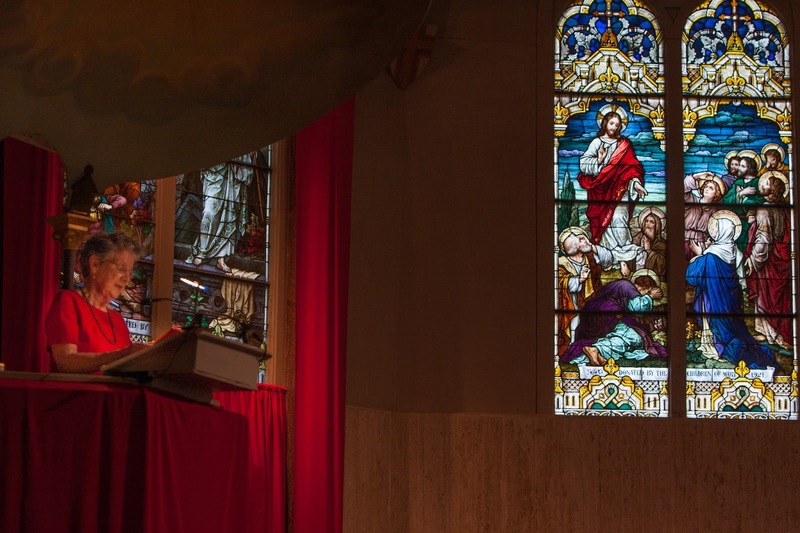 The current homily is available on a link on the front page of the website next to the link for the current week's bulletin. On the page with the prior bulletins, the corresponding homily will be sitting side by side with its bulletin. We started on the anniversary of the start of the Catholic Church, Pentecost Sunday --- over three years ago. This homily, Thanksgiving Mass for our New Pope is our two hundred and forty eighth! podcast to be posted. The homily is given by Father James Brady. Pope Francis ... Cardinal Jorge Mario Bergoglio, a Jesuit of Buenos Aires, Argentina. Join us for Mass at 6 PM at St. Landry Catholic Church to celebrate! Here's a short biography of our new Holy Father. White Smoke! Habemus Papam! 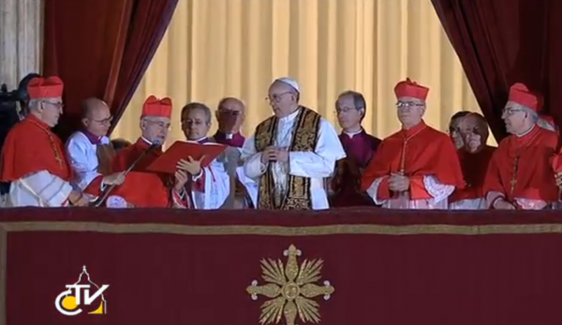 We have a Pope! Two votes already today ... black smoke. No consensus as to who the new Pope will be. We've completed 3 rounds of balloting. Two votes this afternoon. And we'll probably next see smoke at 1 P.M. today. One vote today ... black smoke. No consensus as to who the new Pope will be. The next vote will be tomorrow. And we'll probably next see smoke at 6 A.M. tomorrow. 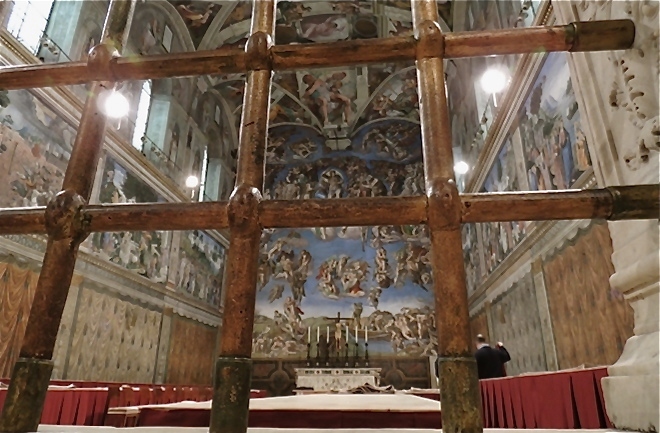 And with that announcement from the Papal Master of Ceremonies, the cardinals have been locked within the Sistine Chapel in conclave. The word "conclave" means "with key". There are two votes in the morning session. Two in the afternoon session. The burning of ballots happens twice a day ... once at the end of each session. 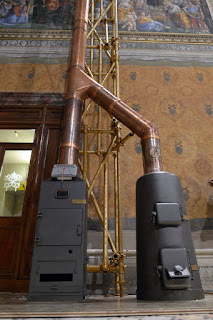 If no "winner arises" … smoke will emerge from the chimney at the end of the morning session - about 12 p.m. Rome time (6 a.m. CST) - and again at the end of the afternoon session - about 7 p.m. Rome time (1 p.m. CST). They’ll burn two sets of ballots each time. 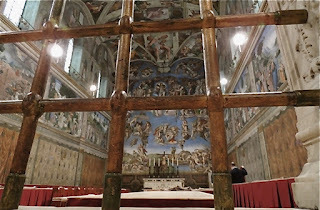 But if the earlier vote in a session -- morning 10:30 a.m. Rome time (4:30 a.m. CST) or evening 5:30 p.m. Rome time (11:30 a.m. CST) --- yields a pope, white smoke would emerge at that time, ending the conclave. So … the latest we will see smoke is 1 p.m. CST. The earliest could be 4:30 a.m. CST. Should cardinals decide to begin with votes today, we would see smoke around 1 p.m. CST. It is assumed that no one will have enough votes to be elected pontiff in the first vote so we should see black smoke then. On Tuesday afternoon, March 12, 2013, the cardinals will begin their deliberations in the conclave. 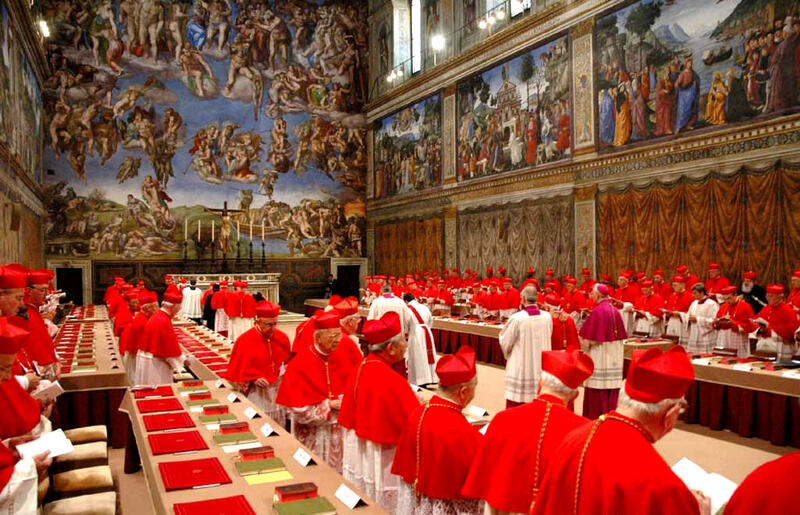 Each day, the cardinals will vote twice in the morning and twice in the afternoon until they've selected a new Holy Father for our Church. One of the most important things that we can do is to pray for our cardinals and for our Church. The cardinals will pray the following Mass Prayer tomorrow morning. It is a beautiful prayer that we can all pray. Once a successor has been chosen ... the famous white smoke ..., Deacon Dwayne Joubert will be mobilizing our parish youth group. They'll be decorating the church grounds with hundreds of papal colored white and yellow flag pennants. 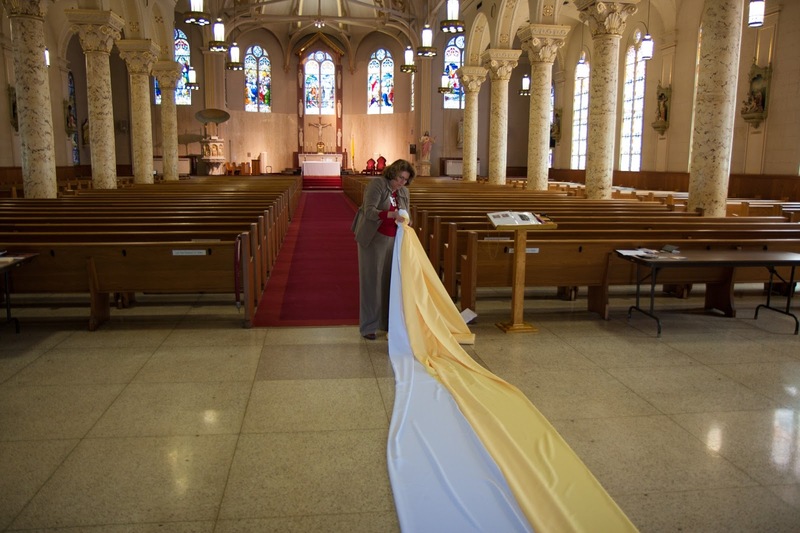 Yellow and white bunting will also decorate all of the doors of the church. Also, on the day that our new Pope is elected, we will celebrate with a Mass of Thanksgiving at 6 PM at St. Landry Catholic Church. We'll send a blog posting out and update the website when that happens. 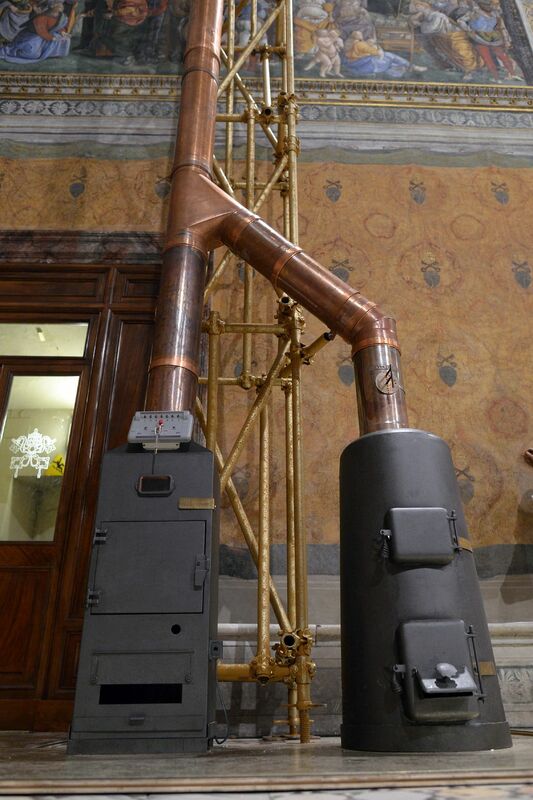 Stoves used to burn ballots and generate white or black smoke. The current week's homily is available on a link on the front page of the website next to the link for the current week's bulletin. On the page with the prior bulletins, the corresponding homily will be sitting side by side with its bulletin. We started on the anniversary of the start of the Catholic Church, Pentecost Sunday --- over three years ago. This week, the Fourth Sunday of Lent is our two hundred and forty seventh! podcast to be posted. The homily is given by Father James Brady. This weekend, we celebrate Laetare Sunday, the Fourth Sunday of Lent. It marks “half time” in our Yearly Lenten journey. Laetare means to rejoice, and this Sunday is a time when we in the middle of our Lenten journey joyfully anticipate the Easter mystery celebrated in the liturgies of the Triduum (Holy Thursday, Good Friday, and Easter). The priests and deacons wear rose colored vestments this weekend, “lightening up” the Lenten violet. Now is an appropriate time to look ahead to the Easter Season. There will be much going on after Easter in our parish, so please mark your calendars and, if possible, attend the following celebrations. These parish celebrations of the sacraments and our parish picnic highlight the joy of the Easter Season in our parish community. As we continue to make our Lenten journey, let us renew our efforts in the discipline of prayer, almsgiving and fasting so we can more deeply appreciate and celebrate the gift of Easter. The bulletin for the week of March 10, 2013 has been posted. Click here to see it. The current week's homily is available on a link on the front page of the website next to the link for the current week's bulletin. On the page with the prior bulletins, the corresponding homily will be sitting side by side with its bulletin. We started on the anniversary of the start of the Catholic Church, Pentecost Sunday --- over three years ago. This week, the Third Sunday of Lent is our two hundred and forty sixth! podcast to be posted. The homily is given by Father James Brady.